In 2009, the cities of Denver and Aurora, CO both confiscated Service Dogs belonging to US Veterans and Disabled Persons. This action was done so under these cities ban on "Pit Bull" type dogs. According to regulations set forth by the Americans with Disabilities Act, A federal, state, municipal, or city government may not discriminate, ban or regulate a Service Dog based on breed. Source - http://www.ada.gov/service_animals_2010.pdf The U.S. Department of Justice issued a federal mandate to both the cities of Denver and Aurora, CO to amend their local laws to allow for Service Dogs of any breed. The compliance of this mandate was due on March 15, 2011. As of today's date, neither city has come into compliance with the national standard. 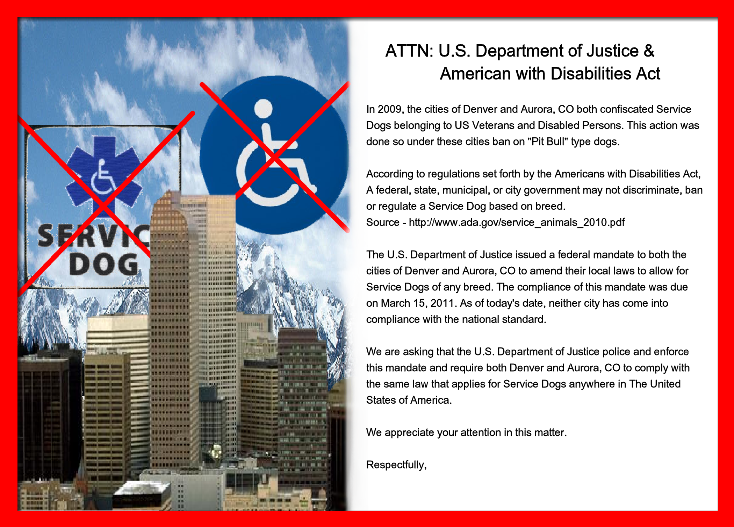 We are asking that the U.S. Department of Justice police and enforce this mandate and require both Denver and Aurora, CO to comply with the same law that applies for Service Dogs anywhere in The United States of America. We appreciate your attention in this matter. 800-514-0301 (voice) or 800-514-0383 (TDD).